Francis was born in Navarre, Spain in the Castle of Xavier. In 1525, he travelled to Paris and it was there that he met St. Ignatius of Loyola and it was he with whom Francis received Holy Orders in Venice in 1537. In 1540, Francis was sent to evangelize in India. He laboured in Western India, as well as the island of Ceylon, Malacca, Molucca islands and the island of Mindanao in the Philippines as well as in Japan. Francis started a voyage to China in 1552 but died on Sanclan Island. St. Francis was one of the church’s most illustrious missionaries and he came from a noble Basque family in Spain. He did his studies at the university of Paris where he then taught Philosophy after first obtaining his degree as Master of Arts. It was whilst at this university that he met Ignatius of Loyola and he was enrolled as one of the first seven Jesuits. Francis and Ignatius decided to travel to the Holy land, but were prevented from doing so due to a war between the Turks and Venice, so for a time Francis laboured at Padua, Bologna, and in Rome. In 1540, Ignatius chose Francis as the first missionary serving the Portuguese East Indies.Francis sailed from Lisbon, in the company of four papal briefs which made him nuncio with full powers and they recommended him to the Eastern Princes. Francis landed at Goa and his vast apostolate which lasted over ten years in duration began there. There Francis instructed the adults, gathered the children by the ringing of a bell in the streets, he catechized them, and he he also served by visiting the hospitals and prisons. After this, Francis turned to teaching the native Indians, doing so by fitting the verses to the tunes of popular songs. Francis then travelled to Cape Comorin and there he began the conversion of paravas, and it was here that on some days he baptised so many people that at nights through fatigue, he was unable to lift his arm. From here he travelled to Travencore where in various villages he founded forty=five churches. Next he travelled to Malacca in Malaya where he spent the next eighteen months going from island to island, preaching, instructing and baptising. When Francis arrived back in Goa, he heard of vast numbers of souls that were awaiting them in Japan, so he took along some companions and set sail arriving in Kagoshima in 1549, where he learned the language, preached and taught with huge success. In 1551, Francis returned to Malacca to revisit his converts there and it was whilst on this visit that the new goal of Pagan China loomed up, but he was not to reach it. Francis arrived on the Island of Sancian at the mouth of the Canton river and here became ill with a fever and would’ve died on the sands of the shore but a poor man named Alvarez found him and took him to his hut. Here Francis lingered for two weeks, praying in between his bouts of delirium and he finally died with his eyes tenderly fixed upon his crucifix. Francis was buried in a shallow grave and his body was covered with quicklime and when his body was exhumed three months later, it was found to be fresh and incorrupt. His body was taken to Goa where it is still enshrined. 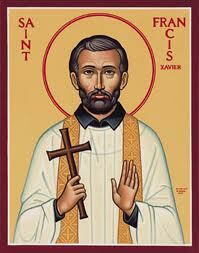 St. Francis Xavier was proclaimed Patron of foreign Missions and of all Missionary works by Pope St. Pius X.